Special holders with two Teflon dowel pads and Teflon fixing screw. 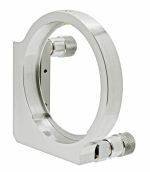 The mount is ideal for precision adjustment of 1" (25,4 mm), 2" (50.8 mm), 3" (76.2 mm), 4" (101.6 mm) or 6" (152.4) mirrors or beamsplitters. The mount comes with 9S65M screw as standard. You may choose different screws. If you order the mount with alternative screws, please specify this in order, by appending the screw code name to the mount code. See section Fine adjustment screws for screws and their codes. 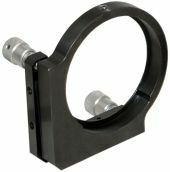 A special holder with two contact lines for optics and plastic fixing screw. Models for 1",2" and 3" optics made entirely of black anodized steel (back and front plates). 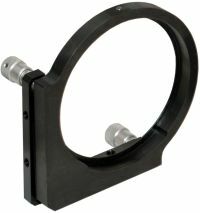 Model for 6" optics uses front plate made of black anodized aluminium. 1 Micrometer can be replaced with fine screw.